The People's Council of Turkmenistan will name the new head of state on February 14. That Gurbankuly Berdymuhammedov will be the new president is a foregone conclusion. Here is an interview with Bairam Shihmuradov, one of the leaders of the oppositionist Republican Party, on Berdymuhammedov and on what awaits Turkmenistan under his leadership. Ferghana.Ru: What do you know of your father Boris Shihmuradov? 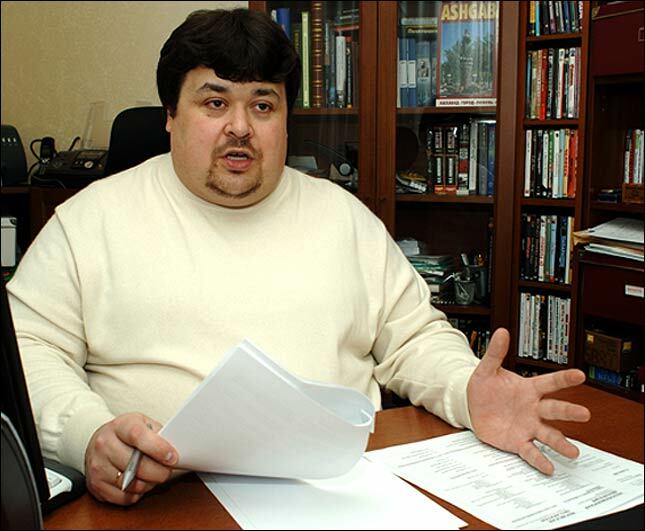 Bairam Shihmuradov: Nothing ever since his arrest in December 2002. We appealed more than once to the Turkmen authorities including the presidential apparat, prosecutor general, and Interior Ministry. We even appealed to the Foreign Ministry of the Russian Federation for information on Shihmuradov's whereabouts and state of health, for the permission to see materials of the investigation and trial... The Russian Foreign Ministry should have responded because the father is a citizen of Russia (we have all documents proving it). I know as well that the Russian Embassy in Turkmenistan kept asking the Turkmens to permit its diplomats to meet with Shihmuradov but all these requests were an exercise in futility. Either the Russians were not sufficiently insistent, or the Kremlin was giving Niyazov too much leeway. My father was sentenced to life imprisonment. I heard the rumors that he had died in jail more then once, on as many occasions in fact as I heard that he was still alive. All these rumors were unsubstantiated of course and I eventually learned not to pay attention. I'm not going to believe anyone or anything unless I see him with my own eyes. Ferghana.Ru: Shall we expect a thaw and denouncement of the cult of personality in Turkmenistan now? Do you think Gurbankuly Berdymuhammedov will keep his promises to voters once he settles in? Bairam Shihmuradov: As for denouncement of the cult of personality, I do not really expect it for the time being, but that does not matter, you know. Much more important will be for the new authorities to really dispel Niyazov's myth of the "Golden Age of the Turkmens" and return the country, step by step, to normal life. Neither should we forget that complete recovery will take time. We need to choose the correct way and follow it. Once the population becomes aware of changes for the better and sees that the future holds a promise after all, it will eventually acquire a taste for creative labor. That's the only means of overcoming consequences of 15 years of economic and social deterioration. As for the promises Berdymuhammedov made, I do not really think that he has or will have any alternative to keeping them. When he was talking of the necessity to reorganize the systems of education, health care, and pensions, he knew that he would be compelled to reorganize them indeed. He knows better that jeopardize his newly acquired repute of a stateperson. After all, it was not the people he was making the promises to, it was the international community. And the international community (Moscow, Washington, New York, Vienna) responded with a signal to Berdymuhammedov that came down to "All right, we'll see what kind of reformer you are." There is no such thing as partial freedom. Freedom either is, or it is not. Make information available to the people, permit the young to communicate with their foreign equals in age, and you will never succeed in persuading the Turkmens that they need some special democracy. They will never swallow it, you know. I earnestly hope that Berdymuhammedov understood it when he was making promises and that he is smart enough not to try and go back on his word. Ferghana.Ru: Is Berdymuhammedov a leader indeed or is he just a puppet in the hands of others, men like Rejepov? What do you think of the former and the latter? Bairam Shihmuradov: One has to know Berdymuhammedov to venture a guess on what he will do under the circumstances. As for me, I do not expect Berdymuhammedov to prove himself a trail-blazer. I merely hope that he commands sufficient common sense, determination, and organizing skills. Akmurad Rejepov has been one of the most powerful men in Turkmenistan for years. The first to know of Niyazov's death, Rejepov had a unique opportunity to take over. Speculating on his part of a puppet-master behind the curtain, some analysts seem to forget a simple maxim that one does not rule the state by giving orders by telephone. Refusing to step forward into the spotlight, Rejepov deliberately let Berdymuhammedov take some operational initiative. It follows that there must be some degree of mutual trust between these two men, at least for the time being. Moreover, they have always acted in a clearly coordinated and considerate manner. Legitimacy of these actions is questionable but they may be justified in the long run. Everything will depend on exactly how Berdymuhammedov and Rejepov use their new powers now. As for Ovezgeldy Atayev, the imprisoned chairman of the parliament, I earnestly wish him good health and patience. Ferghana.Ru: Do you think the new president of Turkmenistan may become another "monarch" of Niyazov's type? Bairam Shihmuradov: Niyazov has ruled since 1985. At first, he was a young and energetic functionary. Even quite democratic. Neither did Niyazov display any penchant for authoritarianism in the first years of sovereignty of Turkmenistan. He did not fear the media then, he travelled a lot, accepted criticism adequately, and remained a dedicated worker. It took Niyazov a decade to become a bloodsucker. There are no reasons for the time being to view Berdymuhammedov as a dictator or condemn him for the crimes he has not even committed yet. No matter what we think, man needs some time to prove himself. Judging him by his former work with Niyazov is wrong. A lot of decent and worthy men worked with Niyazov, and not every one of them had the courage to speak up against the dictatorship. That's everyone's personal affair. Ferghana.Ru: What can you say about social activeness of the population of Turkmenistan? Bairam Shihmuradov: Social activeness needs a developed framework of civil society's institutions to become noticeable. In Turkmenistan, however, civil society does not exist. Everyone is scared. Everyone only talks at home, after making sure that the phone is covered with a pillow or something. On the other hand, this state of affairs has embittered the people and this bitterness may take some ugly forms sooner or later. Society does not trust the authorities, and this trust will have to be built up from scratch. Only then society will be able to display its social activeness effectively, and the powers-that-be will be taking it adequately and promoting interests of the general public. Ferghana.Ru: Is the Turkmen opposition through with internal discord? How would you call its unquestionable leader? Bairam Shihmuradov: As a matter of fact, I do not see the point in all this fuss over the so called "consolidation of the opposition". Who said that the opposition must be united? Who needs it? Avdy Kuliyev calls himself "leader of the united democratic opposition of Turkmenistan", but what if he does? If you are interested, try and find out numerical strength of this "opposition". And yet, Kuliyev comes up with harebrained schemes and proposals on a practically daily basis. Consider his "dough revolution"! When I heard of it for the first time, I thought it was a joke. I really did. It turned out that it was not. There was some sort of conference under way in Vienna, and Kuliyev in his speech promised to send 100,000 tons of dough to Turkmenistan. He meant 100 tons of course. And you know, nobody was surprised. Probably because nobody was listening. Kuliyev wrote a book titled "Two years in the government, thirteen in the opposition". A dubious accomplishment, if you ask me. Nothing to take pride in because he never accomplished anything in either capacity. As for the book, it's memoirs of a chronic loser where he condemns absolutely everyone, calling people KGB agents... Well, Mr. Kuliyev wouldn't recognize the outcome of the February 11 election as legitimate. He said he would struggle for a new election. He is a grownup, he should have stopped playing games long ago. Kuliyev and his lot celebrated my father's arrest. They did not even conceal it. Am I supposed to be making alliances with him after that? The Republican Party and Hudaiberdy Orazov's Vatan Movement proclaimed establishment of a political coalition not long ago. We trust each other, we cooperate even though our views are not identical on everything. Still, it does not prevent us from respecting each other and from seeking the truth in debates. Consolidation with lazybones is the last thing we need. Ferghana.Ru: Does the Republican Party recognize election of the president as legitimate? Bairam Shihmuradov: Much to our regret, whether we do or not is not going to change anything. That is why we've abstained from categorical statements. We believe in the meantime that the election was prepared and carried out with gross violations of the acting legislation of Turkmenistan and international standards. There were no UN or OSCE observers to monitor the election. There were lots of guests instead. Let these people dwell on legitimacy of the new Turkmen authorities. We will concentrate on more pressing matters. Ferghana.Ru: Do Turkmen and Uzbek oppositions cooperate? Bairam Shihmuradov: We stumble across our Uzbek colleagues (politicians, human rights activists, journalists) at international meetings and conferences. The situation in Uzbekistan is different. Very many opposition activists live and work in their native country, which is more than could be said about us. In any case, we regularly discuss matters of mutual interest, say, within the framework of the Central Asian Democratic Congress our party belongs to. Republican Party Chairman Nurmuhammed Hanamov is staying in touch with leaders of Uzbek political parties and movement. I have no doubts whatsoever that it will help us. Ferghana.Ru: What can the opposition do for its country when it itself is abroad? Bairam Shihmuradov: When it is abroad, the opposition cannot do anything "for". Only "against". That's my personal opinion of course, an opinion someone may disagree with. We did what we could to help topple the dictatorship. We compiled and spread information on illegitimate activities of the authorities, we tried to enlist the services of the external forces to do something about the Turkmen crisis... It was a vicious battle that cost very many their lives. The situation is different now, and we should become different too. For the sake of our killed families and friends, for the sake of our fellow countrymen who suffered so much. We should do whatever it takes to make sure that they did not suffer and die for nothing. We should stop our destructive activities therefore and become creative instead. What's the use in our refusal to recognize legitimacy of the election? We should prepare ourselves for participation in the political process, study foreign experience, establish contact with local specialists including the ones the former regime sacked. The Turkmenbashi left a mess - a thoroughly lopsided economy, shortage of food, The Ruhnama, drugs, and overcrowded prisons. Screaming "Let us come in to Turkmenistan!" is easy. What these screamers are going to with the mess if they are permitted to come back? They do not know. The Republican Party is entering a new phase of development. The Republican Declaration, our platform, will be published soon. We welcome everyone to participate in its discussion. We have never campaigned to boost membership until now, but that's going to change. We will have our charter and program published and invite everyone who shares liberal values to join the Republican Party. And we are learning... and wish others were too. Shihmuradov was born in Moscow on June 1, 1973. He finished secondary school and became a student of the International Commerce Faculty of the Moscow State Institute of International Relations of the Foreign Ministry in 1990. Shihmuradov moved to Turkmenistan in 1993 and completed his education at Turkmen State University named after Mahtumkuli where he majored in criminal law. The diploma received, Shihmuradov refused to join law enforcement agencies. He chose the career of a sports manager instead (football club Kopetdag, Ashkhabad) and became a journalist as well. Shihmuradov left Turkmenistan in March 2001. He is married, one daughter.